101010 - A mummy's inane blabberings..
My li' nephew arrived yesterday night on the 10 of October at 10pm! It was after 6 hours of labour and Jennifer had a drug-free delivery (must kowkow to her man!) Jen said that when she'd finally decided that she couldn't endure the pain and requested for epidural, the nurses told her that it was time to push already. Tyler's a sleepyhead according to Jen..He's been sleeping throughout the day so far. She has no problem breastfeeding him which is great! 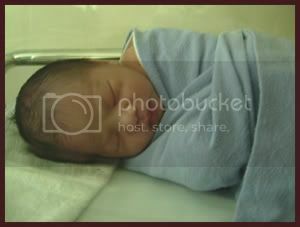 Gonna be heading down to the hospital now to ogle at sayang my li' nephew again. They had a few names in mind but finally they decided on Tyler..alliteration leh! heh..
And yes, no makeup at all..and yet she still looks so fresh and lovely! heh..u v good at giving compliments ah.Jen will sure be happy when she reads this entry! Oh my... wasn't she like just 3 mths preggie when I last had black pepper crab at your place? Has it been that long and so fast? Congrats to the new parents and may joy and happiness permeates the entire family..
Jen's my sis-in-law but i'll accept the compliment just the same hehehe (buay paiseh)! See you on Thursday night eh!! What a gorgeous mama! She certainly looks wonderful for someone who has just given birth! Congrats on being an aunty. Your nephew is a sweetie. I love new born pics, thanks for sharing! 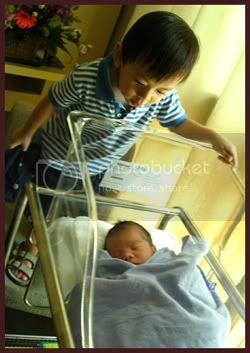 Im so happy to be an aunty you know..My bro's the baby of the family and now he's a father. Can tell that he's really so excited over the birth. Seeing my nephew brings back so many memories of Aidan as a wee babe too. in the first pic, the mother looks like HK actress Xuanxuan! she looks absolutely radiant! and the baby's a lil cutie! yes..i agree. 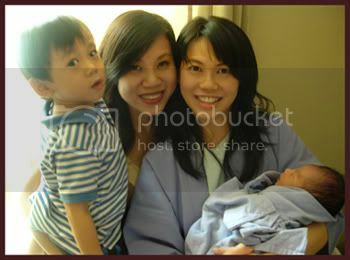 I always thought that Jen does look a li' like Jessica Hsuan..And Tyler's really cute eh although I have yet to see him with his eyes open. We cant figure who he looks like yet! hanor..! I also say! Unlike me..damn buay zai! Low threshhold of pain. baby Tyler is so lovely! :D i love the 2nd pic! n Jen's lookin really good i'll say! heh, n baby arrives just after their traditional weddin. cool! heh..i was thinking that too. Heng ah we did it that week coz her baby was supposed to be due on the 18th! hee. the baby looks lovely! the 2nd pic of him looks like he is scratching his head. hee. 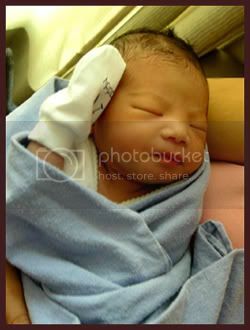 he does look really cute eh.I cant wait for him to open his eyes so that I can see whose eyes he have! gosh.. jen looks gorgeous even after just giving birth... wow. heh..why does Jen look like alot of pple? :D.. Pretty mums and cute babes you have there! Wow... so much happened to your family within such a short period *hugs* Your Dad finally got a grandson! Yes..alot has happened this year..Quite eventful i must say..
Congratulations! I am so happy that the birth went well and that your newphew is doing fabulous too! I wished I had gone down with the rest to visit! But as I said, I felt pai seh la! Don't really know her. I was so excited to see his photo on K's phone! You should have! I would have met u then heh! Can I email you your colleague's photos with Jen & Tyler? heh..it does make me gian too too. Everyone seems to be breeding siah!